Ole Gunnar Solskjaer refers to it as "an environment with inner justice", a place forever juggling adult stresses with back-of-the-schoolbus immaturities. In it, he could be as witheringly vicious as anyone. Probably knew he had to be. Rio Ferdinand tells a story of one of his first Carrington training sessions after signing from Leeds for £30 million and being on the wrong end of a deliberately over-aggressive Roy Keane pass. As the ball spooned up off Ferdinand's shin, Solskjaer's was the first voice he heard. The Norwegian might have been baby-faced, but he was cold-blooded and pitiless too. His view of the world was an echo of Alex Ferguson's. A hymn to intolerance, in other words. It took him time to get there, to recognise Ferguson's subtle tools of exploring human resilience. Once, he complained to Steve McClaren about being endlessly on Keane's team in five-a-sides and, accordingly, cursed to endure the blow-torch of a Cork temper. McClaren smiled. "Oh, you've noticed" he said. "It's a mental development for you to stand up for yourself against Roy. And you have done, so you've passed!" Perhaps the simplistic view of Solskjaer's return to Old Trafford last December was that it wouldn't amount to much more than a group hug. That he'd be just some kind of affable day-tripper, parachuted in to lift the resigned listlessness of Jose Mourinho's unravelled regime. But that view was blind to the steel in Solskjaer's story. Then again, his appearance has always fooled people, Keane admitting that when he first set eyes on Solskjaer at Carrington, he presumed him to be just "a schoolboy fan". Yet, the United staff and players soon came to recognise that they'd found a natural-born killer. Ferguson has described him as the best finisher from his success-laden 27 years at Old Trafford, despite the claims of men like Andy Cole, Ruud van Nistelrooy and Wayne Rooney. In fact, Bayern Munich, PSV Eindhoven and Liverpool all, reputedly, expressed an interest in the diminutive Molde striker before his £1.5 million signing for United in July '96. Yet, if anything, his arrival underwhelmed supporters, given speculation at the time that United might sign Alan Shearer from Blackburn Rovers. That reticence didn't linger. "Probably the best signing the club ever made," gushes Keane in his autobiography. "He looked about 16. But when we got the balls out I realised - everyone did - what an extraordinary finisher he was." Only Solskjaer's physical limitations would deny a regular starting spot for the player Ferguson came to call the "substitute from hell". His even demeanour accommodated the manager's preference, Ferguson recognising that he was dealing with a player whose ego never got in the way. Yet, Solskjaer admitted in retirement that he considered himself better than any of United's other strikers, his belief in the power of the collective simply over-riding any instinct to complain. Though United were willing to let him leave for Tottenham a year before he scored that goal in Barcelona ('99), Ferguson always cherished Solskjaer's selflessness. And he could, he insists, see a manager in the making. "His thought processes underpinned his skills," Ferguson would write in his 2013 autobiography. "He had that analytical mind. As soon as he arrived in a shooting position, he had it all sized up. He had mental pictures everywhere. Yet he didn't play all the time because he wasn't the most aggressive of strikers. He developed more of that later, but he was a slender young man without the physique, in his early days, to clear a path. "In games, sitting on the bench and in training sessions, he would make notes, always. So, by the time he came on, he had analysed who the opponents were, what positions they were assuming. He had those images all worked out. The game was laid out for him like a diagram and he knew where to go and when. "We knew he was content with his role and that helped us because, if we had a difficult decision to make about the other three strikers, which one to leave out, the fourth was content to play a supporting part. "So we just had the three grumpy forwards to deal with. Yorke, Cole and Sheringham." That last line maybe reveals just how easily even his most fervent supporters have tended to misunderstand Solskjaer though. Because the truth is he always bristled at that very assumption of easy compliance. If anything, few bought more fervently into the dressing-room ruthlessness espoused in moments of turmoil by men like Keane than the little Norwegian who Michael Carrick, one of his backroom staff today, describes as a player who "always possessed calm in a storm". In fact, Solskjaer was furious when the manager engaged in a lengthy half-time discussion with fellow substitute Sheringham that famous night in Catalonia they would come back from the dead to be crowned European champions. He admitted years later that that image "p****d" him off, given he'd scored 17 goals for United that season, mostly off the bench. The sight of Sheringham then being sent on ahead of him was, Solskjaer recalls, "the way to trigger me; to make me feel, 'I'm going to prove you wrong!'" As it happens, he probably did the opposite, Sheringham and Solskjaer both scoring those injury-time goals to seal one of the greatest nights in United's (and Ferguson's) history. A knee injury forced his retirement in '07, United immediately re-deploying him as a coach (Ferguson had him working with the first-team strikers) and club ambassador before appointing him reserve team-manager in '08. Around this time, he was also offered the job of managing Norway, turning his national federation down on Ferguson's advice that it was too soon. Three years later, he became manager of Molde, instantly delivering back-to-back league titles that were broadly seen as triumphs made possible by the economic woes of Norway's dominant club, Rosenborg. He then sought (and ignored) Ferguson's advice in 2014 when taking over a struggling Cardiff side that was duly relegated from the Premier League. Solskjaer's brief spell in Wales is recalled as a time of almost glaring naivety, of an impractical commitment to playing attractive football in what was, effectively, a war-zone. He thus returned to Molde, a tiny city on the banks of the Romsdalsfjord, and its homely Aker Stadion where the locals have, since, settled back in pursuit of a re-stabilised Rosenborg. And, when the Norwegian season kicks off again next month, his assistant - Erling Moe - will be caretaker manager, ostensibly until May. But few expect Solskjaer home now. Norwegian football journalist, Lars Sivertsen, describes managing United as the job Solskjaer wants "above all others on the planet". And it does seem his to lose now, with just a single defeat on his record since replacing Mourinho after United's 1-3 pre-Christmas defeat at Anfield. He joked yesterday about inviting Ferguson to give the team-talk for tomorrow's return collision with a title-chasing Liverpool and there's little doubt that the football now being played under Solskjaer's command carries the same attacking urgency favoured by his old manager. Under Mourinho, United had become one of the slowest transitioning teams in the Premier League. Today, pace is the oxygen for everything they do and the new man's investment of faith in Paul Pogba specifically - a player Solskjaer previously worked with in United's academy - has been transformative. For all that, the bottom line with United today is that they are working far harder as individuals than they were two months ago. 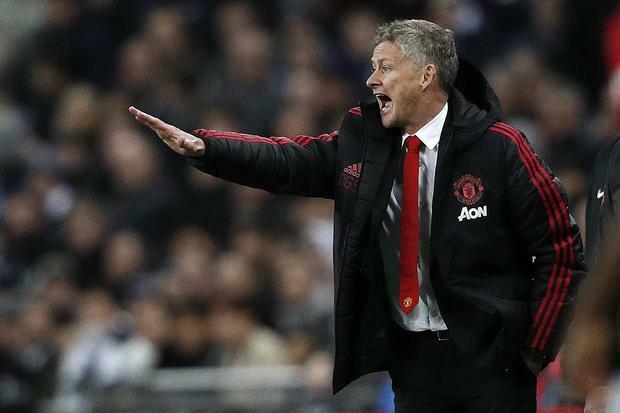 Anecdotally, the word is that Solskjaer has brought that about through some fulminating, nose-to-nose dressing-room exchanges, leaving few in any doubt about his understanding of how the communication of authority must work. It's been a much recycled fact this week that, growing up in Norway, Solskjaer was a Liverpool supporter. He deals with reminders of that fact like someone distancing themselves from an embarrassing old family secret. "You learn as you live, that's the only answer I can give you!" he says now. Tomorrow at Old Trafford, nobody will chase victory more ruthlessly.